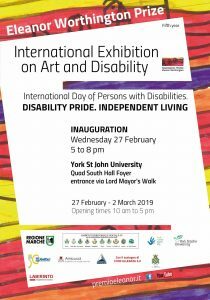 YOU ARE INVITED to the opening of the Eleanor Worthington international exhibition on Art and Disability at York St John University on 27 February at 5 pm. There will be a Sign language interpreter, and audio descriptions of all exhibits. The Civic Party will be present. Drinks available.